Design competitions can be helpful in many ways, especially for someone like me who doesn't do this full-time. Apart from the opportunity to have a game playtested and critiqued by a jury outside my normal gaming circles, the main benefit of competitions is that it establishes creative limits. Most contests have a specific target audience in mind (age, playing time, etc.) as well as specific components that can be used. And there is a time limit — the deadline for the entries — that prevents me from tweaking the game endlessly. These kinds of limits are what get my creative juices flowing and keep me up at night as I try to find something original within that designated design space. 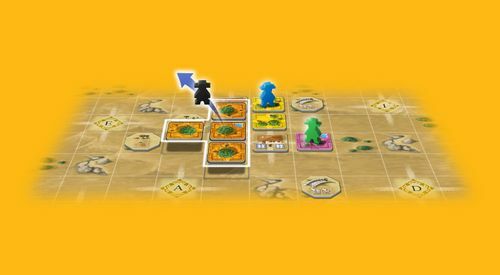 It's not unlike playing a well-designed game that allows one to explore different strategies within a defined set of rules. 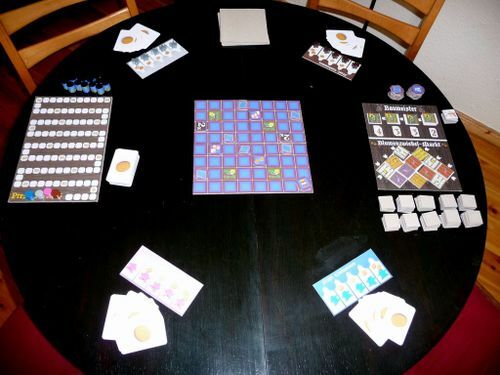 In 2006, not long after I began designing games with my local Berlin group, I decided to finally enter a competition, a rather small one advertised on the Internet that required two-player dice games using only components common in every house. Aside from dice, one could use standard playing cards, pawns, poker chips, etc. To make it more interesting, I invited my new friend, designer Bernd Eisenstein, to compete with me. After all, he had already won the more prestigious Hippodice competition with Maya on his first attempt. I looked forward to seeing what he could create within the boundaries of this competition, and I thought it would be both practical and fun to test our designs with each other. Even though the competition was cancelled before a winner was announced, Bernd and I clearly "won". He helped me develop one of my designs, which became Alea Iacta Est, and he's now working on a multi-player version of his entry which I'm looking forward to seeing someday under his Irongames label. The third design from that competition has taken a number of different forms in the years since. The working title derived from its theme was "Netherlands". 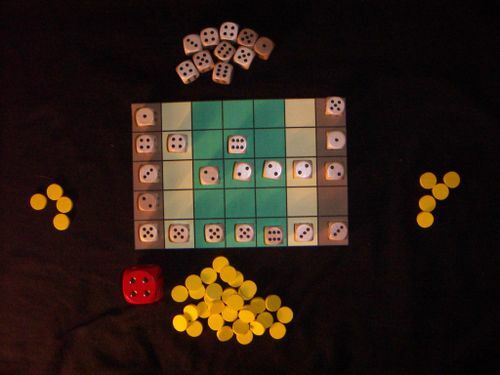 The first version required players to roll 1-3 dice, then bid on them in order to place them on the board. The pips represented different flower types, and dice with the same number were placed adjacent to one another to form regions, which always started from a player's side of the board. The goal was to control as much of the middle of the board as possible, forming large regions and blocking the opponent. The tension came from this little mechanism: having fewer and larger regions scored more points, but having more regions provided more income, which was necessary to bid on the dice. 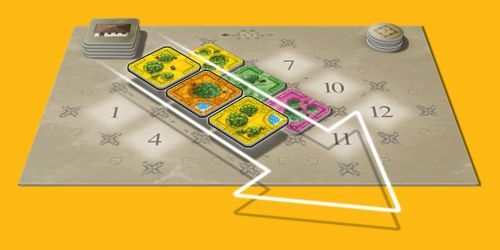 Every region also needed to connect to at least one windmill (the 6s), and windmills could be placed only in the center rows of the board. I opted to focus on what became Alea Iacta Est, however, and didn't dig "Netherlands" out of my prototype closet again until 2008. I replaced the dice with tiles, but kept it as a two-player game. There was some interest from publishers in Nürnburg and Göttingen the following year, but no contracts. Strictly two-player games, I discovered, were very difficult to sell. It went back into the closet. In 2010, I took it out again and decided to make it multi-player. 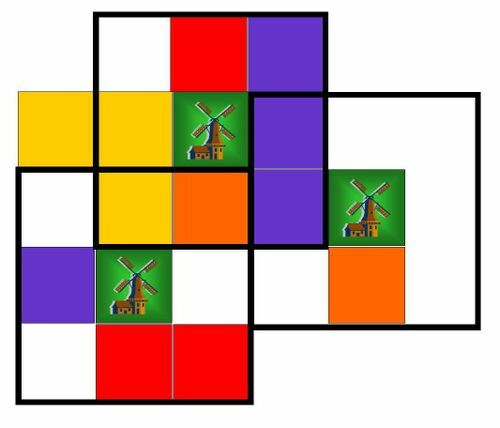 Again, each player started from the edges of the board and tried to build towards the middle where the windmills were built. 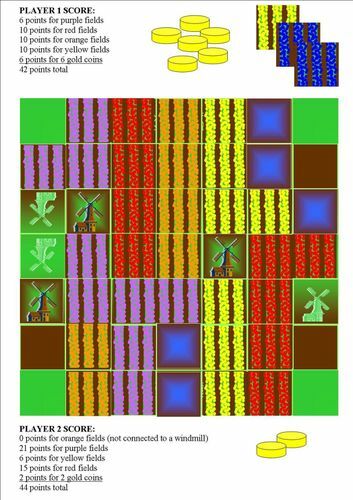 That's when American designer Sam Brown, who was part of our Berlin group for almost a year, suggested that it might be more thematic to have the fields work their way out from a central starting position, and use the windmills to allow for that expansion. I was excited about the design again and tried several versions until I arrived at one that worked well. The game used land boards that each had 16 spaces for flower tiles and windmills, and new boards were added each time a windmill was built on an edge. Windmills were also where players could begin new regions of flowers. I then added a bulb market in which players could buy rows of tiles that were drawn at random from a bag then placed on the market board. Each player also had a set of five farmers to mark each of his regions. The final layer to the game came in the form of cards as a form of money. Each card showed one type of flower, and buying a row of flower tiles required the right set of cards. The mechanism for earning income (drawing cards) provided much of the tension in this version of the game. Instead of buying and placing flower tiles, you could collect income equal to the number of workers you had not yet placed in the fields. A third option was to build a windmill, where all players could begin new regions. My favorite games offer clear, simple options that nevertheless provide interesting dilemmas. After playtesting the latest version of "Netherlands", I was convinced that this was headed in that same direction. As I prepared to bring the prototype to the Göttingen Game Designer's Convention in 2010, however, another tile-laying game with a Netherlands theme was released: Seeland from German powerhouse Ravensburger and veteran designers Günter Burkhardt and Wolfgang Kramer. There was no interest from publishers in Göttingen, and I put the game back into my prototype closet again. In 2011, when I finally attended Spiel, the annual game fair in Essen, Germany for the first time, I brought only a handful of prototypes with me and scheduled a few meetings with publishers, choosing instead to spend more time "taking it all in". My Netherlands prototype was returned to me by a publisher who didn't like it in its current form, and I decided to put it away again for the time being. When Spiel 2012 rolled around, however, I scheduled over a dozen appointments with publishers and had quite a few prototypes ready. I even created a portfolio with photographs and "sell sheets" so that publishers could get a quick overview and decide which prototypes I should unpack from my suitcase to show them. I also decided that enough time had passed since the release of Seeland, so I included "Netherlands" in my portfolio. Perhaps the timing would be better, I thought. Even with my optimism, I could not have guessed that it would receive as much attention as it did. One of those interested in testing the game was Klemens Franz, prolific game illustrator and developer for Lookout Games. After I sent the prototype to him, he reported that he enjoyed playing it, but felt it might fit better with another publisher. As he does illustrations for dlp games, he thought Reiner Stockhausen would be interested and sent it on to him. Soon after, Reiner was in contact with me for an offer to publish "Netherlands" for Spiel in 2013. After such a long wait, it was wonderful to experience such a quick release schedule. I was also excited to work with Reiner as he's an established game designer — and as I expected, he was very hands-on in the development process and invaluable in streamlining the design. His first "cut" was removing the cards from the game in order to focus on the tile placement/worker management mechanism, which he felt was the "innovative core" of the game. With so much back-and-forth, Reiner and I even reached a point where we had developed two different versions of the game, which actually gave us an opportunity to try things we would not have tried if we would have been working on only one version. Some of the bonus tiles, for example, came from the second version that was later abandoned in favor of the first. The fine-tuning focused on the interaction and tempo of the game. Probably the largest change from the original prototype was that the land boards were replaced by a fixed board, and expansion was regulated instead by the addition of the windmills. Except they were no longer windmills. Early on, Reiner asked me if the theme was something I would be willing to change. In the beginning, I had been inspired by the components and program of the design competition, and the product was basically a two-player abstract, but after I had attached the Netherlands theme, many of the new mechanisms were drawn from that theme. Ultimately, in true "Eurogame" fashion, I decided that the mechanisms we had worked so hard to refine mattered the most, and that Reiner, as a small publisher, should be able to use a theme that he feels he can sell. After spending a good deal of time brainstorming, Reiner settled on the theme of citrus growers in southern Spain and called the game Citrus. Klemens, who I have to thank for getting the game to the right publisher, was also excited to do the art for the game. It has been rewarding to finally be able to work with both Reiner and Klemens on a game. It has also been a long and challenging process since that initial design in 2006, but perhaps that will make it all the more appealing to the public at Spiel 2013 in October when they see a mature, ripe game ready for picking in the "orchard" that is the game fair in Essen.